Sunday, December 16th, at 12:00 pm in the Cathedral of Cuenca (Spain), his Excellency Bishop Josemaria Yanguas Sanz celebrated the Holy Mass, during which three Servant Brothers were received as candidates for the priesthood. Fr. 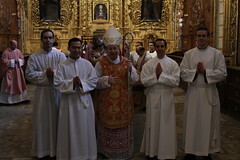 Rafael and some of the Servant Priests of the Home of the Mother concelebrated. In the liturgy of this Sunday, the Church celebrated Gaudete Sunday, marked by a deep joy, especially noted in the antiphons and readings. (It is also distinguished by its liturgical color, the pink or rose color). In the chill of the cathedral, a warmth of joy sprung forth from fervent hearts during the liturgical celebration. In his homily, the Bishop spoke of the importance of knowing the love of God and His desire to be close to us. Since God is near, we should not be afraid. He also said that the mysteries of the faith must be known, savored, and lived. Addressing those who were receiving the Rite of Admission, the Bishop said that they still have a long way to go towards identification with Jesus Christ, the Eternal High Priest. After the homily, one by one the Bishop called forward those who were to be received as candidates for priestly ordination: Andrew Krische, Peter Dittus, Joseph Valle. After expressing their desire to be accepted as candidates for the priesthood, the Bishop blessed them and prayed for them along with all the congregation of faithful present. After the Mass, the Bishop showed a true paternal love in taking the time to speak with the candidates.